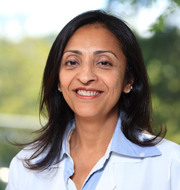 In 1998, Dr. Ruhi S. Khanna graduated from Tufts University School of Dental Medicine with a Doctorate in Dental Medicine (DMD). Prior to that, she had earned Masters degrees in Microbiology and Immunology, and had a career in pharmaceutical research internationally. She has worked at Flawless Dental as an Associate since 2008, becoming the sole owner in 2015. Dr. Khanna specializes in providing comprehensive care to all her patients. This includes an emphasis on early detection of dental problems, and an adherence to minimally invasive dentistry. It requires spending considerable time listening to, and understanding, her patients’ dental issues. She believes in providing a comprehensive treatment plan with a full range of options to each of her patients. Since Flawless Dental has access to a broad range of specialties under a single roof, she can oversee the treatment that best serves her patients’ needs. Dr. Khanna is a Fellow of Las Vegas Institute for Advanced Dental Studies (LVI), a respected dental training institution where she had the good fortune of obtaining hands-on experience with complex dental cases. This year, she embarked on a multi-year professional journey with the Frank Spear dental education center in Scottsdale, Arizona, a facility that delivers advanced training in comprehensive dentistry. This is in addition to regular continuing education courses taken annually at the Schools of Dental Medicine at Tufts and Boston University. Dr. Khanna is a member of the Massachusetts Dental Society, the American Dental Association, the American Association of Women Dentists, the American Academy of Cosmetic Dentistry, and a Fellow of the World Clinical Laser Institute. She has also served as a faculty instructor at Tufts. She lives in Newton with her husband, daughter and son.